Restaurant menus often offer an overwhelming number of different rolls and foods served in various ways – all made with ingredients that most Americans would be unfamiliar with. But for those unknown terms in the world of Japanese cuisine, we’ve created a quick translation guide. Sushi is actually a blanket term that refers to a category of Japanese food made using rice that has been fermented with vinegar, as opposed to being a specific dish. Many refer to sushi as being raw fish, but are actually thinking of sashimi. Sahimi – The word sashimi refers directly to raw sliced meat. Sashimi is served with only slices of fish, with no rice accompanying it. It is often served with soy sauce and a small amount of wasabi. 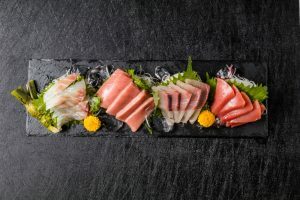 Keep in mind that sashimi and sushi are fundamentally different types of food, even if fish is used in many types of sushi and is the main ingredient in sashimi. Note also that sashimi does not strictly have to be fish, either. A type of sashimi called “gyusashi” is made from beef. Nigiri – This type of sushi gets its name from how it is made. Nigiri means “to grasp,” and references the way the rice is pressed into shape by hand. That rice is then topped with a variety of toppings – often fish. Although many types of sushi have simple presentations, the preparation is anything but. Our sushi chefs take the utmost care in selecting the finest cuts of fish for our sashimi and nigiri, bringing out unique and delicious flavors from each cut depending on how it is sliced or what it is garnished with. View our sushi menu at Shōgun Sakura Sushi — the best Orlando Japanese sushi on International Drive. Call us today at 407-352-1607 or reserve your table online.